Breakfast for dinner is one of my favorite, easy options when I have nothing prepared and no creative capacity to make something involved. Eggs, pancakes, omelets, fritattas, pancakes, crepes - you name it and we’ve had it as dinner. It’s a fun change in the routine every now and then. However, I’ve never really tried dinner for breakfast! Have you? This month’s theme from Recipe ReDux is to come up with a new, healthy take on eating savory, dinner-inspired dishes for breakfast. The easy way to take on this challenge would be just eating dinner leftovers for breakfast. Sure, I could eat some peanut noodles or turkey meatloaf for breakfast, no problem! Breakfast is just at a different time than other meals. It doesn’t mean we have to eat breakfast-specific foods like cereal, avocado toast, or yogurt. Let’s be open-minded here, folks! 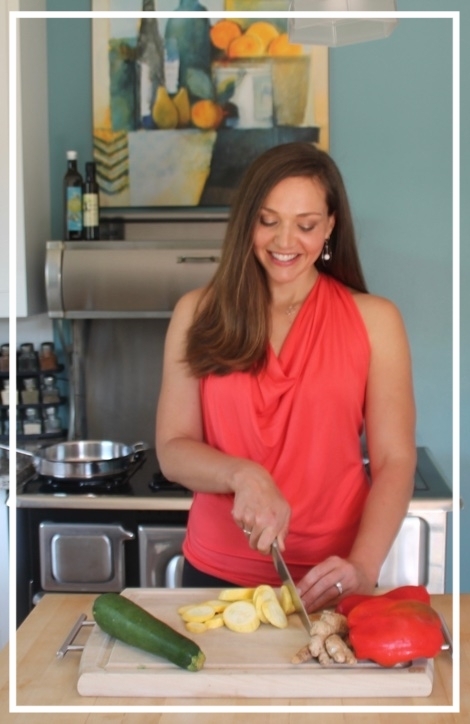 I was going through some of my favorite dinner options that would be quick to throw together in the morning when we all tend to be rushing around, trying to get here or there. What I landed on was tostadas! 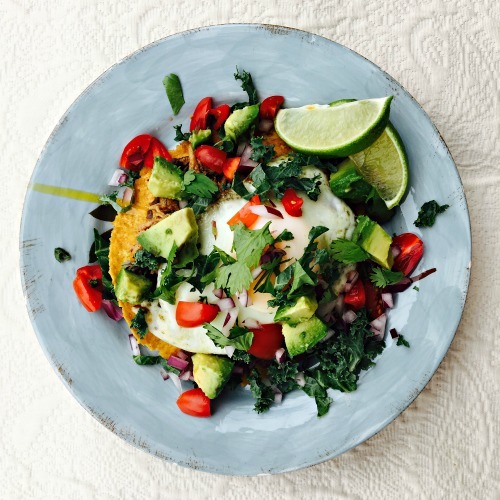 This is one of my go-to choices when we get mexican food and it’s pretty much just a pile of delicious ingredients on a crispy tortilla - sounds easy enough for busy mornings! I believe the definition of tostada is: A beautifully delicious mess. Of course, I need to make a few nutritious upgrades to your typical tostada. My tortillas are baked, not fried. 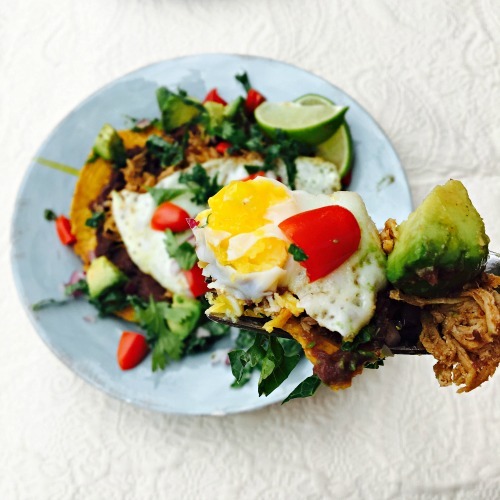 There’s a great source of protein from lean pulled pork shoulder and an egg on top. I used this amazingly delicious recipe for slow cooker carnitas - Mexican pulled pork from Carsbad Cravings. You guys - this is a must try recipe! My usual “refried” beans are homemade with just a bit of milk to make them creamy enough to blend with an immersion blender - not loads of oil. Although, I have to be honest, this time around I just ran out of time and used canned refried black beans instead of the homemade. Still just as delicious! We can’t forget the veggies! 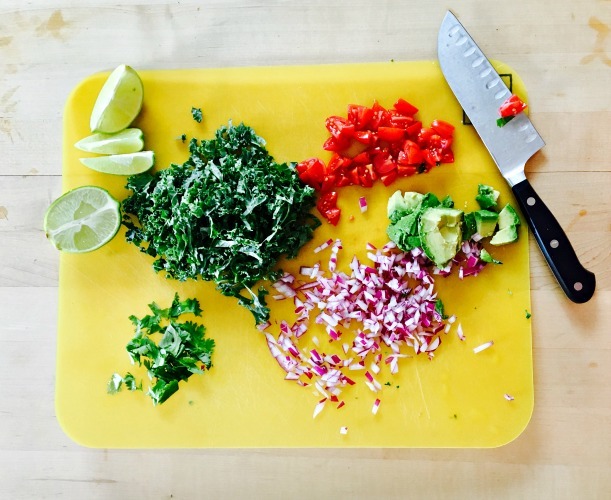 Tomato, avocado, shredded cabbage or greens, red onion, tomatoes, and cilantro are all wonderful topping options. You get to use your taste buds and creative freedom to choose toppings that sound most appealing to you and your family. 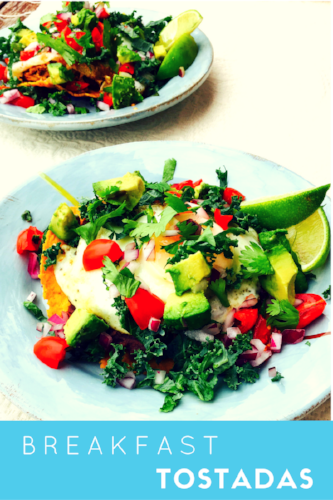 I’m an ALLTHETOPPINGS kinda girl, so my tostadas are usually pretty loaded, but super fresh and nutritious! If you want this even more convenient and low effort, you can use canned refried beans (like I did! ), and a tasty, ready-to-eat pulled chicken breast sold at Trader Joe’s (and many other grocery stores, I’m sure). Give this a try with your family some morning this week or weekend. Save yourself even more time by doing some chopping or preparing the ingredients the night before so you can just pile and go! 2 cups cooked shredded lean pork, chicken, or whatever leftover protein you have from dinner the night before. Pre-heat oven to 350. Spray or lightly brush both sides of tortillas with olive, coconut, or avocado oil. Bake in oven for 10 minutes. Remove baking sheet from oven, flip tortillas, and return to oven for additional 5-10 minutes or until just beginning to brown and get crispy. While tortillas are baking, fry, poach or scramble your eggs in whichever manner you prefer. Warm up refried beans on the stove or in the microwave. Chop, slice, or dice any desired toppings. Once the tortillas are out of the oven, spread each with about 1/3 cup beans, then top each with ½ cup shredded meat/poultry, one cooked egg, and whatever toppings you like! Serve and enjoy immediately!